LCP 1703 VR - Natural Stone - Flex North America, Inc. 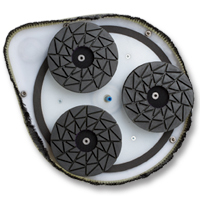 Rugged, reliable hand-operated 12"platform made of Duralimin, a hardened, anodized aluminum. Delivers the perfect speed for high performance grinding, honing and polishing of concrete, granite and marble. Belt driven design for quieter operation and less heat buildup. Slurry Guard” brush design for ease of movement on all surfaces. Center water feed for wet applications can be shut off for efficient dry operation. Uses 3" and 5" diamond polishing pads. 3 Heads are better than one!